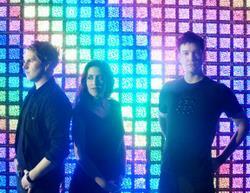 Freezepop is the band that dragged synthpop out of the 80s and into the 21st century. Their third full-length release, Futurefuturefutureperfect, is as perfect a piece of danceable electronic songwriting as you’ve ever heard. But they are really at their best live; I saw them a few weeks ago, in front of a full house at the Middle East, and it was the most fun I’ve had at a concert in ages. The show featured duelling keytars, a shark-encased microphone, and generally playful behaviour from the band, especially the aptly-pseudonymed Liz Enthusiasm. They did a brilliant live version of “Melon Ball Bounce,” a jingle that Raymond Scott wrote for Sprite (which they recorded as a bonus track on Fashion Impression Function). One of the highlights was the Duke of Pannekoeken‘s virtuosic theremin performance on ‘Frontload.’ Sadly, the Duke (Kasson Crooker) has severely curtailed his touring with the band; his day job is keeping him pretty busy.